LOCATION, LOCATION, LOCATION!! This wonderful single-story home is nestled among mature trees and colorful landscaping. It offers an open floor plan, high ceilings, split bedrooms, lots of natural light and low maintenance yard. The welcoming Foyer boasts crown molding and easy-care ceramic tile flooring. The Stacked Formals provide flexible space options to suit your individual needs. The brick fireplace with gas logs is the focal point of the warm and inviting Family Room. The spacious eat-in Kitchen is the heart of the home and features an abundance of cabinetry and counter space, cooktop island, wrap-around breakfast bar, pantry and sunny Breakfast Nook with a window seat. The secluded Master Suite has a sitting area and private access to the back patio. Its nicely appointed bath includes dual sinks, separate shower, jetted tub and large walk-in closet. The Laundry Room offers upper storage cabinets and a convenient sink. 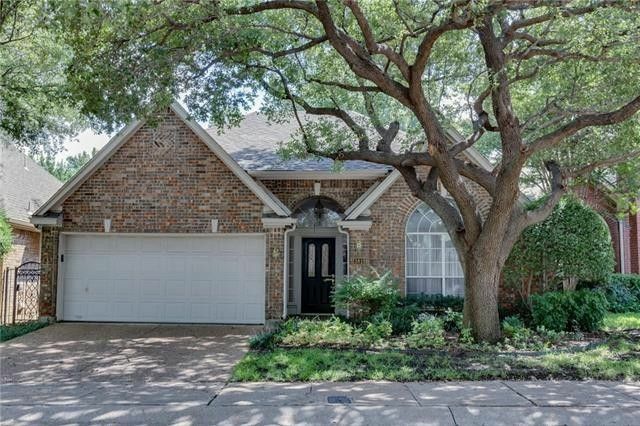 This darling home is just steps from the Addison Athletic Club, miles of hike and bike trails, playground and lake. Located in the heart of Addison, it’s close to major freeways, shopping, entertainment and dining! Directions: From LBJ-635, take Midway North, Left on Proton, Right on Canot, Left on Azure, Home on Right.